One of Michelle Obama’s former aides pressured the prosecutor in charge of the Jussie Smollett case shortly before all charges were dropped. 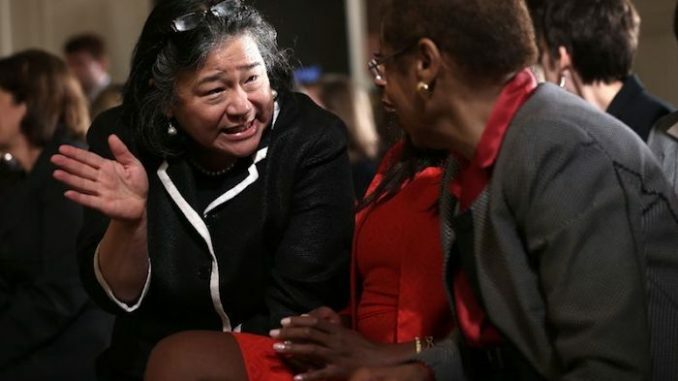 The Chicago Police Union now want a full federal investigation into Cook County State’s Attorney Kim Foxx’s handling of the Smollett case after text messages revealed she was speaking with various members of Smollett’s family and Tina Tchen – Michelle Obama’s former aide. Thegatewaypundit.com reports: In one text exchange with a Smollett relative, Kim Foxx is reassuring them she spoke to the superintendent and asked for a favor. “I’ll keep you posted, “Foxx said in text. “Omg this would be a huge victory,” the Smollett relative said in response. “I make no guarantees, but I’m trying.” Foxx replied. Despite the reams of evidence against Jussie Smollett the Cook County State’s Attorney dropped ALL 16 CHARGES against Smollett on Tuesday! Smollett left the court today and LIED, telling reporters racist, homophobic Trump supporters beat him in a cold Chicago street. Obama organized and CREATED the Smollet criminal acts!